This amazing scene of two 17th Century French Men-of-War ships sailing past the Mäuseturm und Binger Loch seen off in the background was made by Artist, Gustav Schnelle Rüsselsheim. 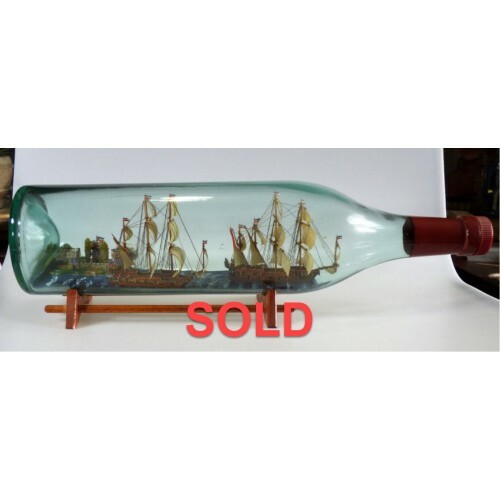 This remarkable model is bottled in a very old 3 liter light green tinted Asbach bottle with a seam line on the top and one on the bottom (as the ships set in the bottle) and a concave or inverted bottom. The bottle is sealed with a cork painted red and there is red paint covering extending approximately 2 3/4" up the neck. About the tower: Mäuseturm und Binger Loch (Mouse Tower and the Bingen hole [bottle neck in the shipping lane]) The small island in front of Bingen had a small fortress on it in the days of the Romans, but which then disappeared. Hatto II, archbishop of Mainz since 968, and thus Lord of Bingen, made the tower on there island famous throughout the world. The population suffered under Hatto's rule. The various versions of the saga all agree that the Mouse Tower bishop was imprisoned in he tower from 969 to 970, where he was attacked by thousands of mice and died. In the 14th century, the tower served as the watchtower for the customs collection castle, Ehrenfels. After that the tower was employed until 1975 as a signal tower to safeguard the passage through the then so dangerous Binger Loch. Approx. Bottle Size 19 1/2" x 4 1/4"